The inspiration for Paper Towers came from my memories of eastern European folktales and the dark illustrations that accompanied them. I imagined a swirl of text and dense black ink and wanted to tell a story. In my research I came across the poems of Kadya Molodowsky and was drawn to the images she created with words. They wove worlds around me. The work that has evolved is a handmade book of five poems and engravings.The engravings are the product of the poems filtered through my memory. The sparks that are letters and words, both sacred and profane, are its essence. I have wrapped the book in them. Five poems by Kadya Molodowsky were reproduced in Yiddish with permission by her literary executor. The translations by Kathryn Hellerstein were reproduced with her permission, as well as her assistance and support throughout. Thirteen woodcuts and engravings were created by Sarah Horowitz. 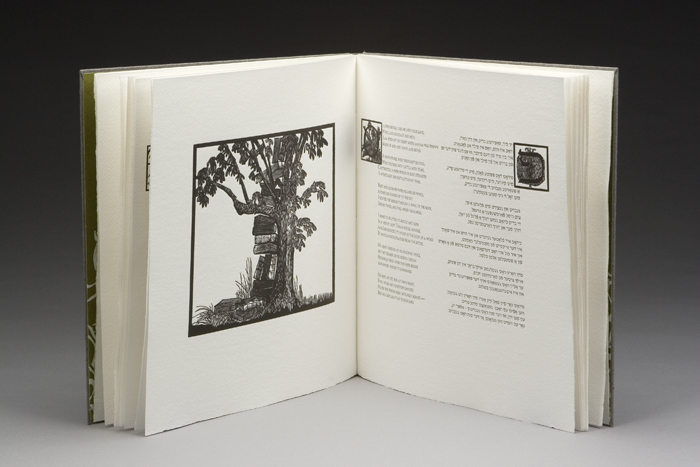 The book was printed on Velke Losiny, handmade Czech paper, at Textura Letterpress by Inge Bruggeman. Claudia Cohen of Seattle bound and boxed the volume in handmade Dutch windmill paper. 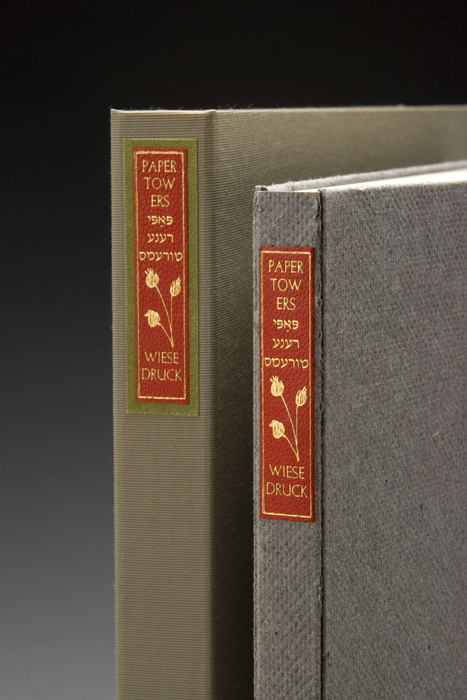 Paper Towers was conceived and produced by Sarah Horowitz of Wiesedruck in Portland, Oregon. The numbered edition is twenty-five, with five additional collaborators' proofs, hors commerce. This project was made possible in part by a grant from the Regional Arts and Culture Council, Portland Oregon.